What is the first word that comes to your mind when you look at this pattern? For me is: Sun! 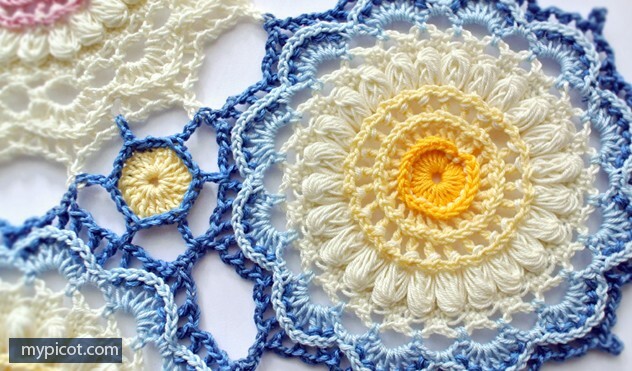 🙂 Get ready for beautiful sunny days with this gorgeous Textured Crochet Motif from my MyPicot. The yellow color in the centre, resembles a sun or a beautiful summer flower, don’t you think? On the designer’s site you’ll find the same pattern in plain color. The beauty and finesse of the pattern is preserved even when it is worked in only one color. I guess the only tough choice you’ll have to make is, really, to choose if you want this pattern worked in one or more colors. Patricia, please click the name of the pattern ( Textured Crochet Motif) to get to the pattern’s page. Hope it helps! I love this pattern. So dainty & beautiful. I love this pattern, it’s very beautiful. But where would I get the tutorial for it? 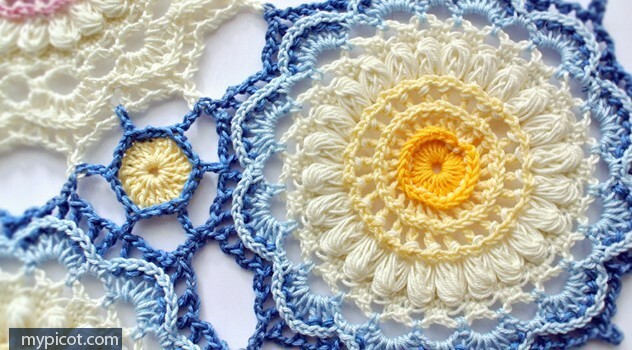 Do you have a video tutorial foe this crochet pattern?